The cheating on exam attitude is a dishonest attitude. It can be done through copying, imitating, quoting, or duplicating the other student’s essay/work to take the advantage in answering the questions of the exam.The aim of the research is to find out the correlation between self – confidence and religiousity toward the cheating on exam. The test of the instrument on the cheating attitude scale gives a result on 46 valid and reliable items. The subject of the research is 87 students by the technique of multistage cluster sampling. The data analysis technique used in the research is the double regression statistical analysis to examine the correlation between self-confidence and religousity with the cheating attitude, and the partial correlation technique to examine each independent variable toward the dependent one. Based on the calculation result using the regression statistical test, it shows that there is a negative correlation between self-confidence and religousity with the cheating attitude of the junior high school students (F= 20,398 and p = 0,000 : p < 0, 001). There is a significantly negative correlation between self-confidence and religousity with the cheating attitude (p = 0,024 ; p < 0,05). There is a very significantly negative correlation between religousity and the cheating attitude (p = 0,000 ; p < 0,01). Ancok, D., Suroso, F. N., & Ardani, M. S. (2000). Psikologi islami: Solusi islam atas problem-problem psikologi. Pustaka Pelajar. Ghufron, M. N., & Wita, R. R. (n.d.). S.(2011). Teori-Teori Psikologi. Jogjakarta: Ar-Ruz Media. Gunawan, H. (2012). Pendidikan Karakter. Bandung: Alfabeta. Indonesia, U.-U. R. (2003). Sistem Pendidikan Nasional. Jakarta: Direktorat Pendidikan Menengah Umum. Nyamwange, C., Ondima, P., & Onderi, P. (2013). Factors Influencing Examination Cheating Among Secondary School Students: A Case of Masaba South District of Kisii County. Elixir Psychology, 56, 13519–13524. Raharjo, P. G. P., & Marwanto, A. (2015). PENGARUH KEPERCAYAAN DIRI DAN KONFORMITAS TEMAN SEBAYA TERHADAP PERILAKU MENYONTEK SISWA KELAS XI JURUSAN TEKNIK PENGELASAN. 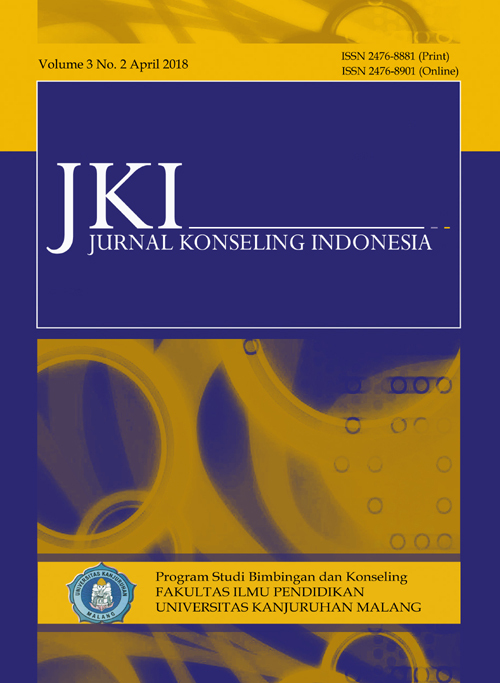 Jurnal Pendidikan Vokasional Teknik Mesin, 3(4), 255–262. Silaen, D. (2015). Hubungan Religiusitas Dengan Intensi Menyontek Pada Mahasiswa Kristen Protestan Universitas Padjadjaran Jatinangor. Universitas Padjadjaran. Solagrasia, K. (2014). Perilaku Menyontek pada Siswa Ditinjau dari Kepercayaan Diri dan Strategi Coping. TALENTA, 3(2). Ula, A. H. (2014). Hubungan antara efikasi diri dan religiusitas dengan intensitas perilaku menyontek pada siswa di MTs Mazra’atul Ulum Paciran Lamongan. Universitas Islan Negeri Maulana Malik Ibrahim. Wairata, N. (2015). Hubungan antara Tingkat Religiusitas dengan Perilaku Menyontek Siswa SMK T&I Kristen Salatiga. Program Studi Psikologi FPSI-UKSW.